Solve puzzles to rescue fellow dwarves trapped in ancient, underground ruins! Dwarven Den. Can you dig it? In Dwarven Den, you play a jolly, little person on an epic quest. Your people discover that their dwarven ancestors are trapped in vast underground mines. Your task is to dig deep through ancient civilizations, solving challenging puzzles along the way, in hopes of saving the other dwarves. Can you dig it? > Blow stuff up with bombs! Install Dwarven Den today. It's free! 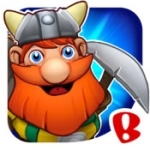 Dwarven Den is brought to you by Backflip Studios, makers of absurdly fun mobile games like DragonVale, Paper Toss, NinJump, Army of Darkness Defense, Ragdoll Blaster, Strike Knight, Shape Shift & more. Search the App Store for "Backflip Studios" to see all our games. Follow @BackflipStudios on Twitter for game announcements and other updates.